On July 14, 2018, Philippine School of Business Administration – Manila (PSBA-Manila) held its annual Freshmen and Transferees Orientation in its Gymnasium. 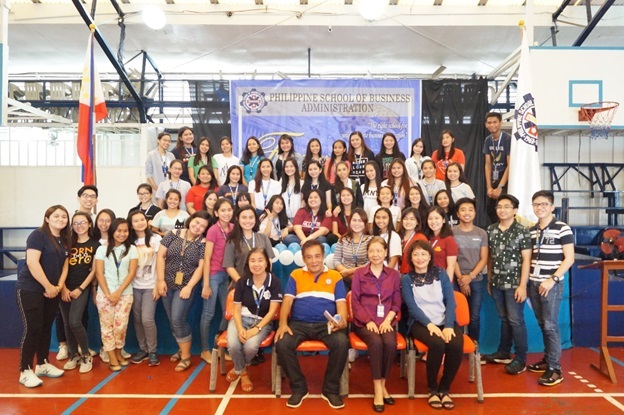 PSBA-Manila Faculty and Staff attended the orientation organized by the Student Service Center (SSC) and facilitated by Mr. Jhorenz B. Ello. 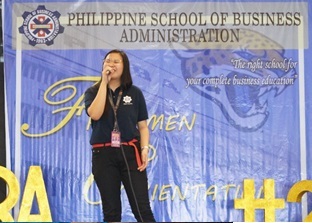 The orientation started with a prayer lead by the Student Service Organization (SSO) Non-Academic Chairperson, Ms. Ma. Gessalyn T. Choo, followed by the National Anthem and PSBA hymn lead by the SSO Executive Staff, Ms. Zonette Mari Asuncion. The freshmen were welcomed with warm remarks from Mr. Ricardo Abreu, Vice Dean, College secretary and Officer-in-Charge of Human Resources. Mr. Abreu introduced the newest members of the PSBA family to what will be their home in the next few years. 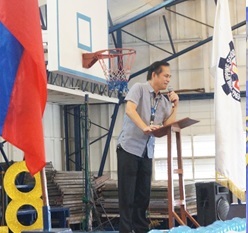 He conveyed the excitement of the Faculty and Staff to work with the freshmen and transferees. 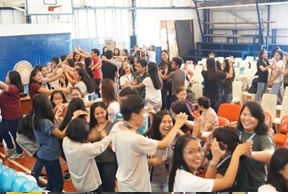 After the beautiful opening remarks by Mr. Abreu, the Student Service Organization prepared a game for the freshmen called “Bahay-Baboy-Bagyo”. After a few minutes of playing the game, they then proceeded to the next game called “Group Yourselves”. These games were fun and paved a way for the freshmen to meet new friends. 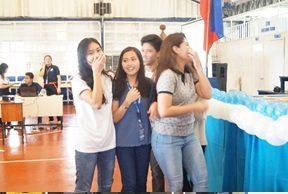 Before proceeding to the orientation proper, Mr. Ello introduced the Student Service Organization officers for the academic year 2018-2019, namely Ms. Abigail Nadonga – Chairman; Ms. Mia Monique Briones – Vice Chairman; Ms. Desiree Batac – Treasurer; Ms. Claudine Joyce Corazo – Academic Committee Chairperson, Ms. Ma. Gessalyn Choo – Non-Academic Committee Chairperson, Ms. Rena Apuyen – Peer Relations Officer, and Executive Staffs: Ms. Zonette Mari Asuncion, Mr. Johann Ancheta, Ms. Zara Jane Linsangan, Ms. Jaira Clair Billones, and Mr. Al-zamil Ismael. 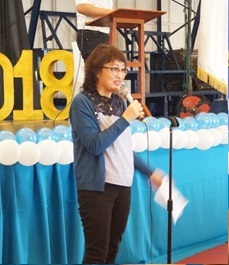 The orientation proper was reinitiated by Ms. Cristina C. Gonzaga, Head of the Bachelor of Science in Accountancy Department and Coordinator of Certified Public Accountant Review. 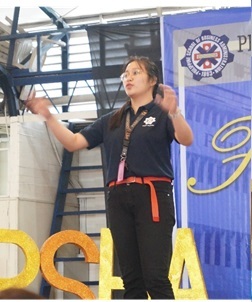 Ms. Gonzaga introduced the Freshmen and Transferees to the PSBA Accounting Program and discussed what PSBA offers to its aspiring Accountancy students and what makes our school different from others, namely our integrated review that other universities/colleges have imitated over time. 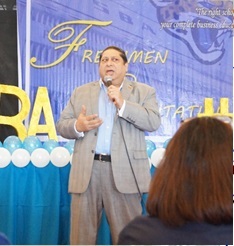 Dr. Tabassam Raza, the Associate Dean of the Graduate School of Business, director DRM Unit and Research and Development, Special Assistant to the President for Planning and linkages, and Adviser for Information and Communication Technology, introduced the PSBA-Manila Graduate School of Business, including the programs offered by PSBA with the Master in Business Administration (MBA), MBA specialization in DRM, and Doctor in Business Administration Programs. The audience was then serenaded by Ms. Zonette Mari Asuncion with her rendition of “Your Love” by Erik Santos, with the audience also singing along. Ms. Erlinda B. Thia followed after the brief intermission. 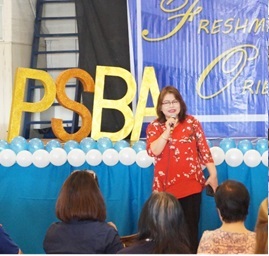 The freshmen were introduced to the Registrar and Director of Student and Alumni Affairs, wherein she discussed what the registrar does for its students and even highlighted that the students are their “boss” and they would do everything to make sure that the students’ records would be kept in an orderly and safe manner. Ms. Thia also assured the students that if ever they would need anything from her, her doors are always open and they could reach out to her anytime. 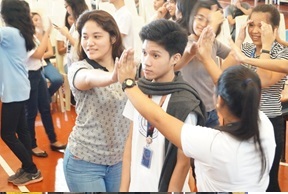 The next to speak is the Guidance Counsellor, Ms. Luz A. Rodriguez—better known by the students as Ms. Luz. 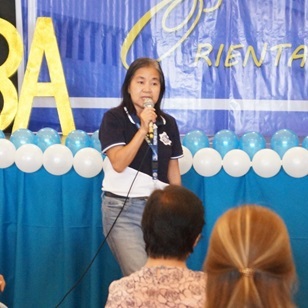 Ms. Luz discussed her role and the office’s role to the students’ lives. 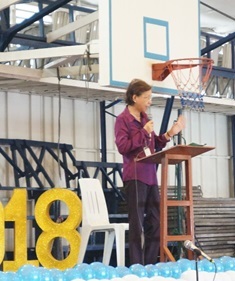 She reassured the freshmen that going to or being in her office doesn’t mean they did something wrong; rather, it is a place where they can talk to her in cases that they truly need a friend because whatever they would talk about would stay between them. Mr. Ello followed with the discussion by sharing his experience with having that heart-to-heart talk with Ms. Luz and how much that helped him stay in PSBA-Manila. 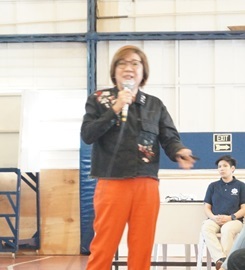 One of our special guests, Ms. Estrelita S. Tan, President of Prima Casa Land & Houses Inc., is one of PSBA-Manila’s alumni. She discussed the Alumni Association of the School and also shared her experience when she was in college and what the school has provided and given her that has helped her get to where she is now. 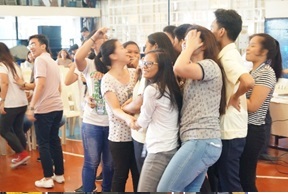 She encouraged the freshmen to study hard and really aim high with their studies. The final discussion was with Ms. Gina T. Sanchez, Executive Secretary of the President, Director, National Service Training Program, where she discussed the Social Orientation and Community Involvement Committee (SOCIC). 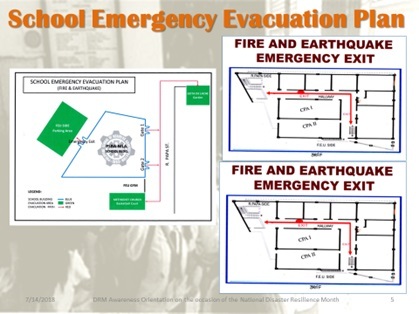 In line with the change of curriculum in the Philippine educational system, was the development of the National Service Training Program and the School’s organizations as a whole. She discussed the roles of every student in the SOCIC, the school departments, the student service center, the school faculty, and the alumni. 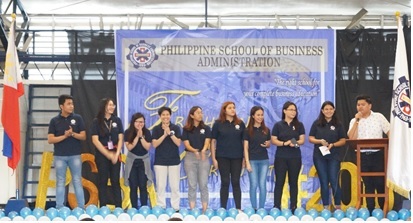 It is very clear that PSBA-Manila does not only want to be known for being the right school for business education but also to be known for being active in serving its community and social responsibility. 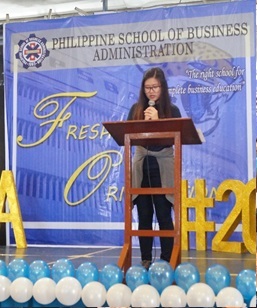 The program ended with closing remarks from the Chairman of the Student Service Organization, Ms. Abigail Nadonga, where she highlighted to the freshmen students the famous lines of Dr. Jose Rizal “Ang kabataanan ang pag-asa ng bayan”. She pointed out that we, as students, have the capacity and capability to bring forth change if we choose to be excellent in everything we do. 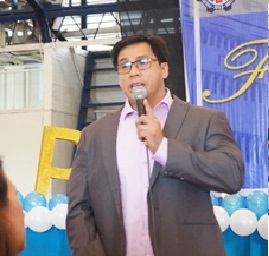 Mr. Ello ended the orientation instilling to the freshmen that PSBA-Manila is indeed the right school for their business education.